I'm pretty sure ladybirds can fly, but it was not for me this time. :-P However I can assure you that this gacha Ladybug Love by Monkey Pox is the cutest! 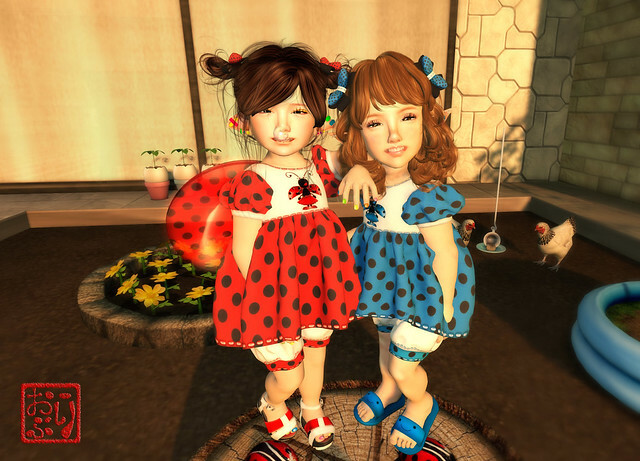 I'm wearing the rare red color that comes with a matching bows, shoes and ladybug wings while my goofy bestfriend is wearing the blue color. The Ladybug Love gacha has 2 rares and 8 commons, and available in Toodledoo baby and kid sizes. This is an exclusive gacha item at the "All The Little Things" event which will start today, March 1st and will end on the 21st. Dirty Stories Updates and New Releases! Hair Day! Free Hair! Limited! More Pink Stuffs, SL Hunt & Freebies!